The demand for cost savings and improved efficiency are a constant demand to public safety organizations everywhere. Simultaneously the mobile connectivity has changed the lives of everyone. With the boom of handheld smartphones every user understands the benefits and capabilities of the wireless internet. TETRA has served well until now, but its low bandwidth data solutions don’t meet modern demands. It is difficult to understand why an expensive public safety vehicle shouldn’t have the same or better capabilities than most of the 1st world teenagers today have in their pockets. Efficient modern public safety organizations demand access to databases like patient records, criminal registers, stolen car registers and even building drawings. A key imperative is that this data is always up to date; otherwise our security and health is endangered. Also other modern applications are needed now and near future. Online, distributed video streaming is probably the most wanted application at the moment. All of the modern PSS services require thus secure, resilient and redundant always online connectivity. The driver in the PSS broadband network development seems to be the possibilities that new LTE technology will provide. There are still many approaches what the development will be, but all of them have the idea that ultimately the whole communication in PSS will be done over high data rate IP networks. First option is to have totally dedicated network for PS sector. The benefits of this solution are the full control over the network, flexibility to changes when needed and dedicated capacity. The major disadvantage is the price, the build-up and ramp-up time and the final coverage and availability achieved with the invested money. Second alternative would be to build just dedicated radio access network. In this scenario the PS would build own dedicated base stations, but would rely on commercial core. The benefits would be that PS could specify the RAN requirements and would have dedicated RAN capacity. Disadvantages are similar to own dedicated networks in RAN cost redundancies. Third option would be to assign dedicated channels for commercial networks. Benefits of this are needed and assured RAN capacity that would be provided cost efficiently. The future flexibility in the pressure of commercial networks could be challenged and thus close co-operation with the commercial carriers would be a requirement. Fourth option is based on an enterprise –type approach. In this case the network would be fully shared, but there would be a special service layer implementation. This would provide high cost efficiency and flexibility in service level agreements. On the other hand, this solution has problems of guaranteeing dedicated capacity to PS users. Fifth and the most service orientated approach is a fully shared retail network. This would be highly cost efficient and would be simple to operate and this approach can be implemented already today. The disadvantages include the inability to give dedicated capacities, would provide for less service flexibility and could mean higher user fees. The sector is using already today quite a few applications where not only the Land Mobile Networks’ data capabilities are used, but also noncritical data applications. These solutions often include vehicle computers with a single broadband link. 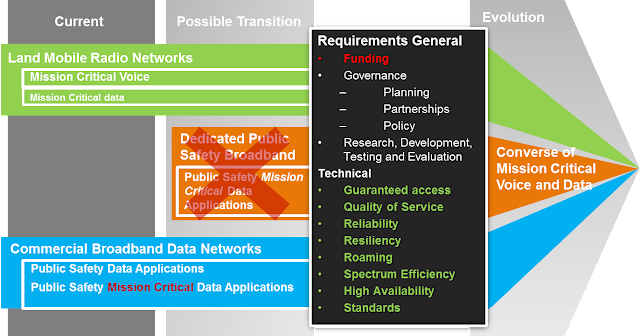 All mission critical data is using the limited capacities of the LMR –networks. The used services require more and more critical data applications and hence the discussion around transitional dedicated networks. The criticality is the key enabler for the future data applications. When the current applications are taken more and more towards enabling criticality, the requirements for the transition need to be taken into more close attention. Let’s look at the general requirements a bit more closely. If we consider the alternatives for the future development presented previously, the funding is the major influencing factor. With the current economical situation in the world, it would be unreasonable to think that a major part of the countries would either build their totally own dedicated broadband networks or even build the access networks required for the critical operation. The alternative of implementing dedicated channels or dedicated service layers seems monetarily more appropriate. This, however, will require a creation of policies, partnerships and planning that will take their time. These novel approaches will also require still research, development and testing. As still all is possible and still price effective, this kind of approaches will certainly provide the paths towards future implementations. The alternative of using existing commercial networks, would be easiest to implement but questions the most important aspect of the future services. Will commercial networks ever fulfill the criticality demands of PS data? 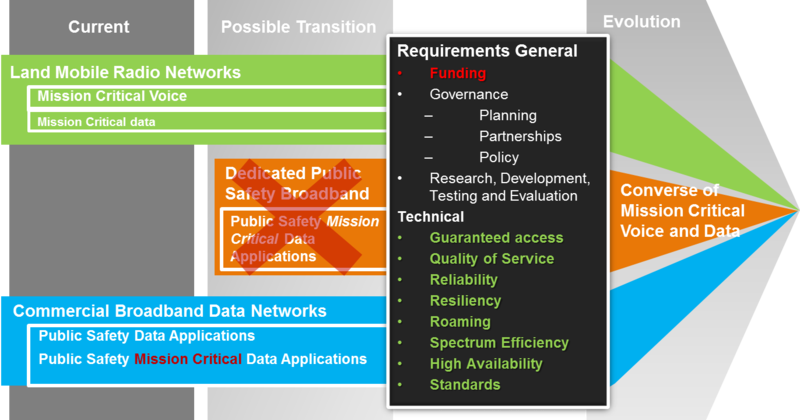 If we could overcome the challenges of guaranteed access, quality of service, reliability, resiliency, interoperability, spectrum efficiency and high availability with current networks, we could use existing solutions for mission critical data. This would also mean that no transitional network phase is needed. This is certainly an interesting thought.